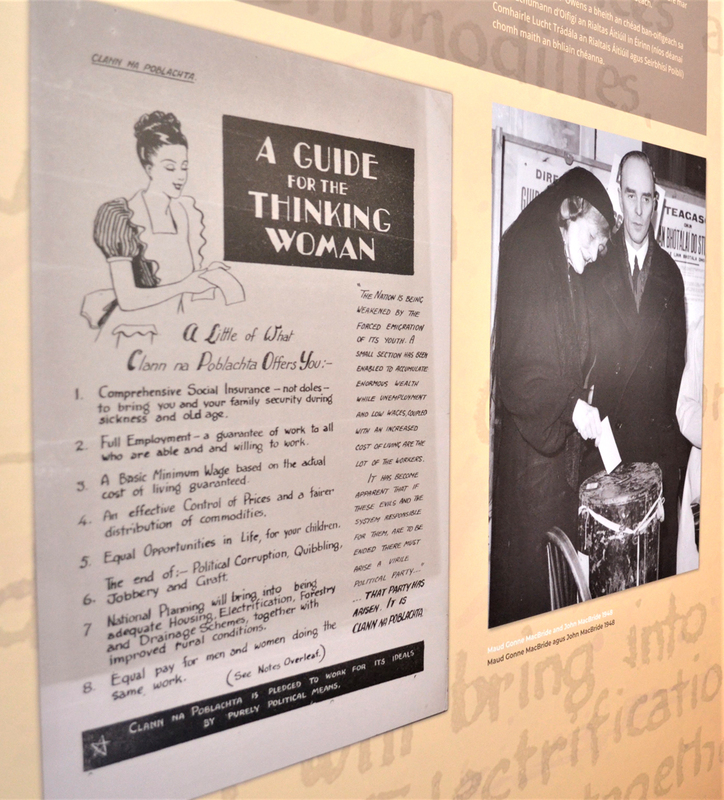 We visited Donegal County Museum for the first look at an eye-opening exhibition celebrating the women who shaped Ireland. The exhibition is sure to intrigue, shock and inspire many as visitors are taken on a journey from the days after women won the vote through to the present government. Curator and historian Sinéad McCoole was in Donegal this week to set up her work in Donegal County Museum Letterkenny, where it will remain on display until the end of June. From the moment you step into the museum, you are guided along Irish women’s push for progress in politics, education, careers and home life. While the displays are mainly focused on political figures, stories emerge of many women who had set themselves apart from their husbands or families to express their own voice and fight for change. Life for women of decades gone by is illustrated through films, interactive displays, clothing, historical objects and information panels. Some photos and information had never been seen before, as Sinead revealed how she sourced memorabilia from families and the women featured. Donegal has had only two female TDs in Dáil Éireann since 1918. They are former Fianna Fáil TD and Senator Cecilia Keaveney and Former Tánaiste Mary Coughlan, who both feature in the exhibition. Visitors will also read the story of SDLP founder member Brid Rodgers from Gaoth Dobhair, who was politically active in Northern Ireland from the 1970s. 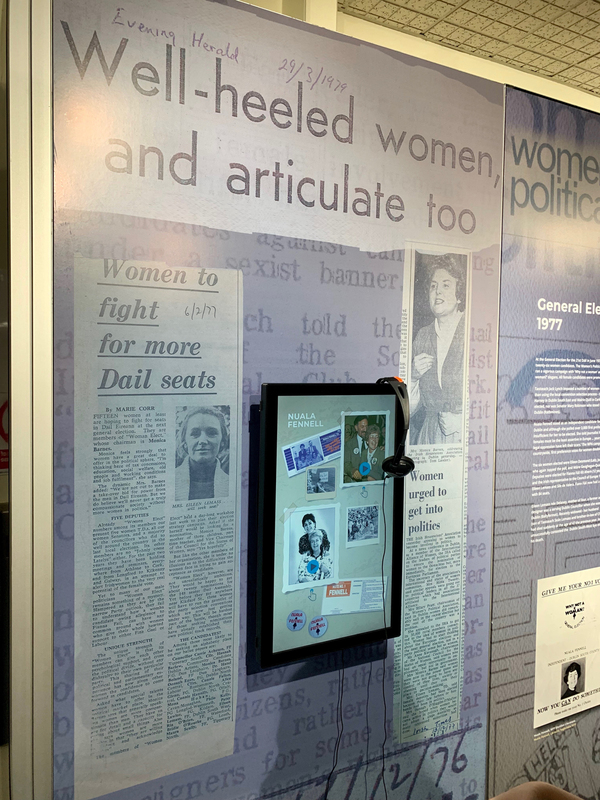 As local elections grow closer, this exhibition serves as a reminder that things have changed dramatically for women in politics in recent decades. But we’re not near any kind of balance yet. Women currently make up 22% of the 32nd Dáil and 32% of the Seanad. Here in Donegal, the County Council has the lowest female representation in Ireland, with three out of 33 council seats held by women. ‘100 Years of Women in Politics and Public Life’ is a worthwhile visit for men and women of all ages. The people, dates of change, movements and stories are sure to ignite debate and create greater awareness of the achievements of both famous and lesser-known women in Ireland. Donegal County Museum is the only Ulster venue to host the temporary exhibition for this 2019 tour. The exhibition is free to visit and supported by the Department of Culture, Heritage and the Gaeltacht as part of the Decade of Centenaries programme. For more information follow Donegal County Museum on Facebook and Twitter.